I’m headed to Gen Con 2018, excited to play games, see friends, and talk to publishers! As I’m headed up the road to Indianapolis, there are a few news items and deals worth mentioning. At EN World, Angus Abranson shares Strange Machine Games announcement that they’re launching a new Robotech RPG. In the 1980s, Harmony Gold licensed three Japanese anime series and bolted them together to create Robotech. This series spawned, among other things, The Robotech Role-Playing Game by Palladium Books (1986 to 1998, and 2008 to 2018). With the lapse of Palladium’s license, Strange Machine Games is picking it up and creating a new game. Which is a win for gamers! However, as Chris Helton (Dorkland Blog) pointed out, Harmony Gold’s Frankenstein-ime… er, license expires on March 14, 2021. [Here’s Karen Ressler’s article about that end here on Anime News Network.] They are hitting the ground running (From their Facebook page: “Hello Robotech Fans! If you want to see a hard copy preview of the Robotech RPG game, visit our booth at GenCon: 2963. We will have 1 or 2 on hand!”) That said, they have two-and-a-half years before the parent company’s license ends and that implies SMG’s Robotech RPG will have a limited run. Which begs the question, how much of the franchise will they be able to cover? I contacted Strange Machine Games, however, Gen Con prep prevented us for connecting in detail but they are “happy to discuss the project”. Expect an interview/discussion post-con. Are you into tabletop RPGS? Have you ever wanted to work on a game? Are you a member of an underrepresented group in TTRPGs (Person of Color, Woman, Non-binary, Trans, Queer)? Among the applicants was DC Comics writer, Route 3 creator, BlackSci-Fi.com EiC, and Tessera Guild member, Robert Jeffrey (Facebook). NAP selected Robert to freelance on their “Post Apotheosis Space Opera RPG”, Orun. 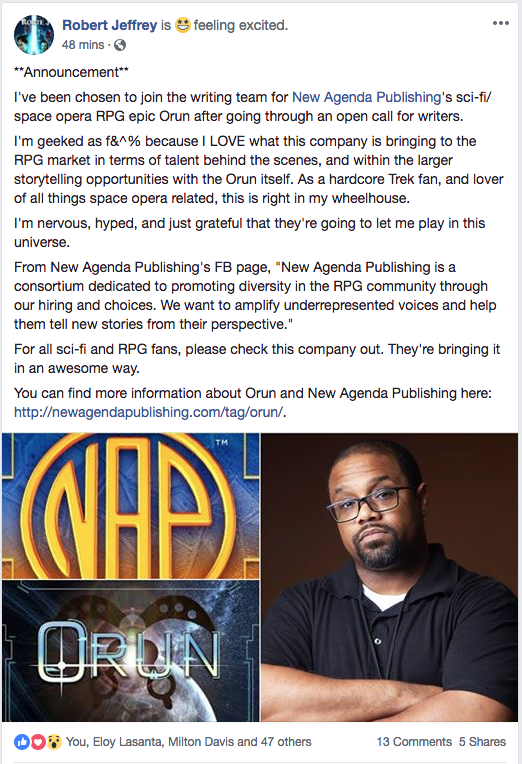 As Robert shares below (screenshot from his Facebook page), I, too, am geeked as f&^% about this, NAP made a great choice and Robert is going to bring a lot of good to RPG. At Gen Con, on DriveThruRPG, and on Kickstarter there are DEALS to be had! 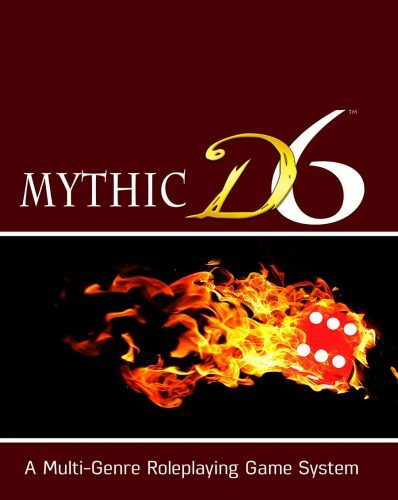 At Gen Con, “Find Jerry, get a FREE MYTHIC D6 Book!” Jerry D. Grayson of Khepera Publishing (and New Agenda Publishing) will be looking for three folks that know the secret pass phrase of the day. If you see Jerry, give him the phrase, and get a free Mythic D6 book! A free physical book! Each day’s phrase is here. Ray Machuga of Higher Grounds Publishing is going to be wandering Gen Con. If you find him, take a picture, post it, and he’ll give you a copy of his game. Check out the details here. Not going to Gen Con but you still want something free from Zweihänder? Introduced on Gary Gygax Day, Grim & Perilous Studios are offering a free Zweihänder Grim and Perilous RPG preview/supplement showcasing “our Henchman profession from the upcoming supplement Main Gauche. 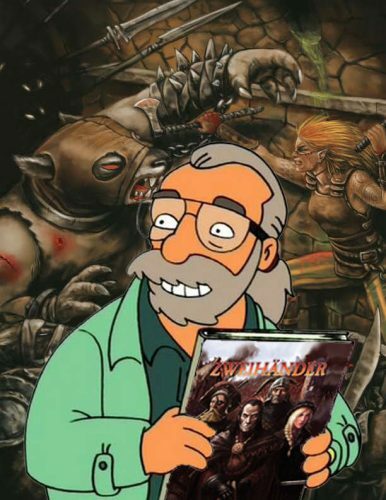 We’re also including the Dungeoneer, an expert profession from Zweihänder Grim & Perious RPG.” You can get the Gary Gygax Day – Zweihänder Grim and Perilous RPG as a Pay What You Want (“Suggested Price $0.00”) on DriveThruRPG here. On Kickstarter, Palegain Press is running a campaign to develop Flower of Heaven: Shrine of the Fallen Heroes, “An Asian themed module for the Universal Storytelling System: Second Edition“. The $10 backer reward, Mountain Spirits, gets you both a PDF of the module plus a PDF of the Universal Storytelling System: Second Edition. Ends on Tue, August 14 2018 9:59 AM EDT. Find the campaign here. What Am I Playing At Gen Con 2018? Among others, and I hope to see you there!